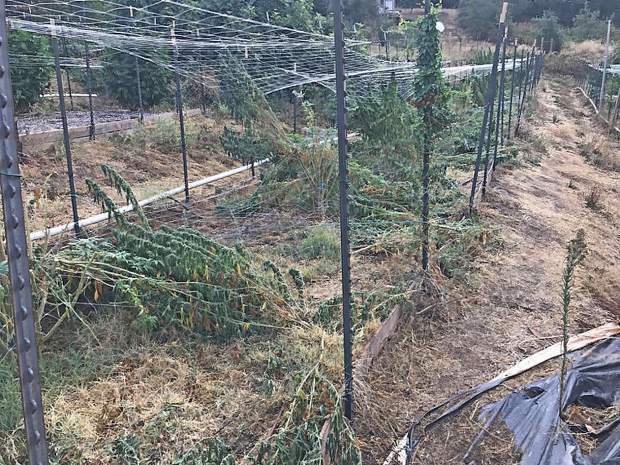 On Sept. 5, all of the marijuana plants being grown at The Mighty Lichen Farm in the Brownsville area of Yuba County were cut down. At some point on the night of Sept. 5, Enosh Baker’s medical marijuana garden was cut down. It wasn’t one of the several volunteers he had working for him on his farm in the Yuba County foothills. He doesn’t think it was the county or sheriff’s department, which have been actively monitoring pot grows throughout the area for violations of the current cultivation ordinance. Yuba County Sheriff’s Lt. Wendell Anderson, who is also in charge of the department’s marijuana enforcement team, said they have no record of Baker or his farm. “As a department, we would go through the proper channels and serve a search warrant before taking any action,” Anderson said. Baker, 32, believes it was a group of “neoconservatives” and “vigilantes” in the county that have been actively doxing cannabis farmers like himself. Buck Weckman, who started Yuba County Families Against Cannabis Trafficking and the political action committee Stop Commercial Pot, has been a leading advocate in trying to eliminate the spread and growth of the marijuana industry throughout the Yuba-Sutter area. Weckman published an opinion piece regarding the need for Yuba County to declare a state of emergency due to the significant amount of illegal marijuana grows throughout the area ­— what he estimates to be more than 1,000. Included in the article was an aerial photograph of Baker’s farm. Weckman said he got a call about a week ago from an individual accusing him of somehow being involved in cutting down the plants at Mighty Lichen Farm, which he said is not true. “If they have a complaint with me, I’d be happy to meet them in front of the sheriff’s office and we can go in together and file a complaint,” he said. Anderson said his department has not received any reports of a group of people going around and cutting cannabis farmers’ plants. Either way, Baker said someone snuck onto his property from a nearby creek in the middle of the night, pried his fence open and crawled on the ground, to cut each plant at the base, all while two of his workers were sleeping on an outside deck within 20 feet of the garden. Baker doesn’t only grow cannabis on his 80 acres in the foothills. The marijuana he grew was only a fraction of his farm, he said, that has everything from apples, pears and plums to figs, olives and grapes, among other things. But because cannabis is such a lucrative plant, it basically was paying to keep the farm running and the upfront costs for the other crops. Now, Baker is in jeopardy of losing his farm because he has nothing to harvest this year in terms of his main moneymaker. He is facing a mortgage payment and property taxes that are beyond his means to pay. The problem for him is that he lives and operates his business in a county and region that is opposed to outdoor cultivation and has reduced the amount of plants that can be grown in recent years. 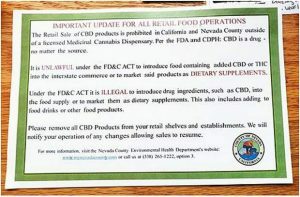 Although recreational marijuana was legalized by California voters in 2016 and will be sold commercially in licensed stores Jan. 1, Baker’s farm is in violation of Yuba County’s current ordinance, meaning his options are limited. Baker graduated from the University of California, Davis, with a degree in wildlife biology. Aside from being a working artist and writer, he also spent time as a microbiologist for Stanford University while pursuing his undergraduate degree. Several of his research articles have been published online at PubMed.gov. Baker went back to school to pursue his doctorate but his endeavor was cut short when police pepper sprayed students at the Davis campus. He was one of several affected, he said. As a primary plaintiff in the case, Baker received a settlement check. He had a choice: either finish his doctorate, or follow his passion for agriculture and start his own farm. He chose the latter and used the money to put a down payment in 2012 on a piece Yuba County land. At that time, the county had established its first marijuana ordinance, which allowed for both indoor and outdoor cultivation. For a property his size, he could grow up to 99 plants. In addition to starting his farm, he wanted his property to be a place where people could go to practice art and culture, as part of an art residency program. At one point, it was even the site of an internship for UC Davis sustainable agriculture students. The location and foothill landscape was perfect for what he wanted to do, but it came at a price. Because the new ordinance allowed for up to 99 plants on certain sized parcels and the landscape was perfect, cannabis farmers saw the foothills as an opportunity to start up their businesses, he said. That, in turn, benefitted the area because those farmers put money toward new infrastructure, repairing roads and the local economy. “People happily did that, and I did too because I thought I was investing in the future,” he said. But after concerns were lodged in 2014 by local residents regarding the “effects of marijuana cultivation on their neighborhoods and the quality of their lives and the lives of their families,” the Yuba County Board of Supervisors decided to initiate a review of its ordinance, according to a 2015 staff report. Yuba County Supervisor Andy Vasquez said the issues with illegal marijuana grows in the county, as well as throughout the state, are only beginning, and will get worse before becoming better. “He got his crop stolen, and that’s going to continue to happen and create problems for the law-abiding citizens of our community,” Vasquez said. “That’s what (these kind of operations) are bringing into the community: cartels and guns. We’ve had two deputies shot, there have been people killed. County supervisors weren’t alone in curbing the industry’s growth in the area. Last year, the majority of Yuba County voters defeated three different marijuana-related measures: increasing the number of medical marijuana plants that could be cultivated; guidelines for medical marijuana dispensaries; allowing commercial cannabis activity within the county. Baker said the shift in public opinion baffled him and other cannabis farmers in the area. 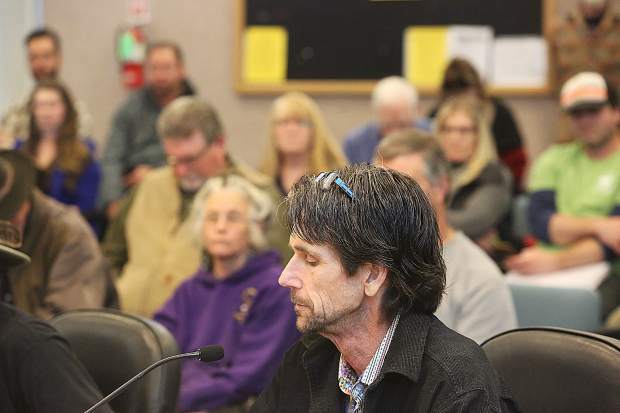 Despite his cannabis garden being cut down and the amended cultivation ordinance, Baker said he is going to continue growing food on his farm and will try to be creative in finding funds to keep his dream alive. “We are going to keep going until we cannot. This place is gorgeous so we are going to try and rent it out as a ‘Bud and Breakfast’ and try to make enough that way to pay back the mortgage payments and property taxes. If we are unable to do that, then I’ll probably find other ways to economically recover, but there is not much you can do when your back is against the wall and you owe money to the bank,” Baker said. He said he is thinking about requesting a reassessment of his property because of the local stance on marijuana and the banning of outdoor grows. He said he believes the assessed value of the property is roughly eight times too high. Baker acknowledged that the Aug. 1 incident in Oregon House, in which two Yuba County Sheriff’s deputies were injured in a shootout with a man who was at an illegal marijuana cultivation site, doesn’t help his argument that cannabis farmers do not pose a risk to the general public. Still, he said the stereotypes some people have regarding marijuana farmers need to change because they do not accurately reflect many of the individuals working in the industry today. Jake Abbott is a reporter for The Appeal Democrat in Marysville. He can be reached at jabbott@appealdemocrat.com.